ThomasJefferson is a Legacy Library. Legacy libraries are the personal libraries of famous readers, entered by LibraryThing members from the Legacy Libraries group. ThomasJefferson is also an author. 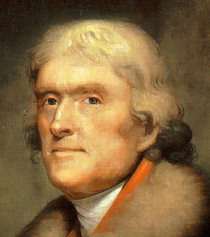 » See Thomas Jefferson's author page. About meThomas Jefferson (13 April 1743 - 4 July 1826), Virginia lawyer, diplomat, and statesman. Author of the Declaration of American Independence; of the Statute of Virginia for Religious Freedom; and Father of the University of Virginia. First American Secretary of State, and third president of the United States. About my libraryA lifelong, insatiable collector of books, Thomas Jefferson built several library collections. From his book lists and correspondence, we know that he had the following book collections. Of these, only the books sold to Congress (section d below) are currently represented in Jefferson's LT catalog; the other collections will be added over the coming months in cooperation with Thomas Jefferson's Monticello. Do note that this is a work in progress - new information is being added, and partial records are still being reviewed and updated. Jefferson inherited his first library from his father, Peter Jefferson, when the latter died in 1757. On 1 February 1770, a fire destroyed almost all of the books in Jefferson’s home at Shadwell. It is not known if Jefferson kept a list of the books he had in his Shadwell Library at the time of the fire. If he did, it would very likely have been destroyed along with all of his personal papers. Thomas Jefferson's LT catalog will soon include a reconstructed list of books that he either inherited, acquired, or was familiar with and hence very likely owned at Shadwell. Jefferson’s second library and his largest is the book collection that he began at Monticello following the fire at Shadwell, and later sold to Congress in 1815. Following the Shadwell fire on 1 February 1770, Jefferson wasted no time in replacing the library he lost. The destruction at Shadwell added impetus to his ambitious plans to develop his library and to his efforts to build his new home at Monticello. By August 1771, Jefferson appears to have already built up a collection he considered to be worthy of inspection by others. In his letter to Robert Skipwith dated 3 August 1771, Jefferson invites Skipwith to the “new Rowanty,” evidently a reference to Monticello, his own "mountain of the world," or "Rowandiz, the Accadian Olympos," and to his library there. By 4 August 1773, Jefferson notes in his Memorandum Books a count of 1,256 volumes in his library at Monticello, not counting volumes of music nor the books he had in Williamsburg. It may well be around this time or even earlier that Jefferson creates a manuscript list or a catalog (which eventually becomes the 1783 Catalog) of the books he had on his shelves to help keep track of his burgeoning library. In 1784 as he left America to take up his appointment by Congress as minister plenipotentiary to France, he very likely had with him this catalog of the books he owned, along with titles he intended to acquire abroad. Earlier the previous year in Philadelphia, he had noted on page 5 of this catalog a count of 2,640 volumes as of 6 March 1783. He also states that he had placed a checkmark before each title he owned, and that unmarked titles indicate books that he hoped to acquire. Using this specific notation recorded by Jefferson himself in his 1783 Catalog, scholar Thomas Baughn has reconstructed a list of books that Jefferson owned as of this date. A list of this March 1783 Library Reconstructed library is available here. During his appointment as minister plenipotentiary and later minister to France from 1784 to 1789, Jefferson purchased some 2,000 volumes. Before he returned to America in 1789, he compiled a separate list of the books he acquired while abroad. This 1789 Catalog is a 50-page unbound manuscript in Jefferson’s own hand and is today at the Massachusetts Historical Society. The manuscript pages have been digitized by the Society and are available here. A transcription of this manuscript made by Thomas Baughn is available here. The 1783 Catalog manuscript, a 246-page bound manuscript in Jefferson’s hand, is believed to be a record of his library following the Shadwell fire in 1770. In 1812, when this catalogue became crammed with interlineations, erasures, and marginal insertions, Jefferson made a fair copy of this catalogue, and it is this 1812 catalogue that he probably maintained up till his offer to sell his library to Congress in 1814. This fair copy was retained by the Librarian of Congress George Watterston who claimed it as his personal property when he was dismissed from his post in 1829, and this catalogue has never been found. The Trist Catalogue mentioned below is the closest approximation to the contents and order of this lost manuscript catalogue. The 1783 Catalog is today at the Massachusetts Historical Society. The manuscript pages have been digitized by the Society and are available here. A transcription of this manuscript made by Thomas Baughn is available here. When the invading British army burned the congressional library in Washington, D.C. in 1814, an outraged Jefferson promptly offered his own library to Congress to replace the one that was lost. The handwritten catalog that Jefferson sent to Congress along with his books was retained by the Librarian of Congress, George Watterston, but subsequently lost. This catalog has never been found. In 1942, as part of the bicentennial commemoration of Jefferson’s birth, the Library of Congress commissioned E. Millicent Sowerby to compile an annotated bibliography of the over 6,500 books Jefferson sold to Congress. A five-volume work, The Catalogue of the Library of Thomas Jefferson, was published between 1952 and 1959. This long-time standard reference work for Jefferson scholars is currently available online here through the Library of Congress; a transcribed electronic version of Sowerby's catalogue is available here, and her annotations will be added to the relevant records in Jefferson's LT catalog. Sowerby's catalog was used to create the first version of Jefferson's LT catalog, which is currently being augmented with additional data by Monticello. There is a second manuscript associated with the books Jefferson sold to Congress. In 1823 Jefferson commissioned Nicholas Philip Trist, the young man who would eventually become Jefferson’s private secretary and his grandson-in-law, to recreate a list of the books sold to Congress. This 113-page Trist Catalogue manuscript prepared by Trist was rediscovered at the Library of Congress. The manuscript is available online here from the Library of Congress. The Trist list was also published as a monograph, Thomas Jefferson’s Library: A Catalog with the Entries in His Own Order by James Gilreath and Douglas L. Wilson in 1989. The notation for each title from this list can be found in most of the Comments field of each relevant title in Jefferson's LT catalog, and these are gradually being replaced by direct links to the Trist Catalogue, a transcription which is found here. Following the 1815 sale of the bulk of his library to Congress, Jefferson continued to acquire books. The Retirement Library Catalogue in Jefferson’s own hand constituted his third and final library at Monticello. The 83-page bound manuscript is at the Library of Congress, and is available online here, with a transcription available here. After Jefferson died in 1826, his library at Monticello was sold at auction through auctioneer, Nathaniel P. Poor, in 1829 in Washington, D.C. The printed Poor Catalogue (available online here) is almost identical to the Retirement Library Catalogue. Both the Retirement Library Catalogue and the Poor Catalogue were transcribed by John R. Barden in 1999, and edited by Thomas Baughn. Books from the Retirement Library Catalogue and the Poor Catalogue are currently being added to Jefferson's LT catalog. After Jefferson’s retirement from public office in 1809, he also maintained a library at his Poplar Forest retreat in Bedford County from around 1811. At his death, his books were inherited by his grandson, Francis Eppes, who offered them up for sale in 1873. There is no separate sale catalogue for this library, except for the portion that was listed in the 1873 auction catalogue of George A. Leavitt, published in New York City. The Leavitt Catalogue was transcribed by John R. Barden in 1999, and edited by Thomas Baughn, and is available here. In 2007, Baughn reconstructed a list of books Jefferson is believed to have had at Poplar Forest, based on Jefferson's 1783 catalog and on notitia found in Jefferson’s Retirement Library manuscript and references to specific titles in his retirement correspondence. Books from this list will be included in Jefferson's LT catalog. For more information, go to the Thomas Jefferson's Libraries website at Monticello. For works cited in LibraryThing entries, see the Short Title List available from the project website. See also the Library of Congress' interactive exhibit, Thomas Jefferson's Library. Reviews: The reviews currently included here are taken from Sowerby's annotations. They have been edited for capitalization, but otherwise have been left in original form. Additional reviews are being added from Jefferson's correspondence by Monticello. Tags: The tags as currently included here, for the library sold to Congress, are as given in this chart, as designed by Jefferson in the manuscript catalogue of his library, 1815. A rough approximation appears here (with links to the tags). Links to the bibliographic chapters in Sowerby's text are available here. The tags for his Retirement Library are in accordance with his classification scheme in his Retirement Library Catalogue.